Stranded in t he frozen Antarctic sea for nearly two years, Ernest Shackleton and his team of 27 polar explorers endured extreme temperatures, hazardous ice, dwindling food, and complete isolation. Despite these seemingly insurmountable obstacles, the group remained cohesive, congenial, and mercifully alive—a fact that speaks not just to luck but to an unparalleled feat of leadership. 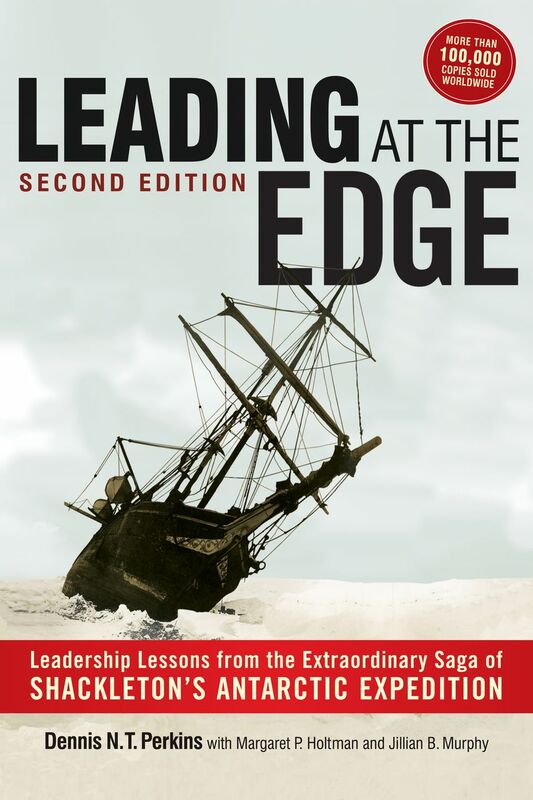 Drawing on this amazing story, Leading at The Edge demonstrates the importance of a strong leader in times of adversity, uncertainty, and change. Never give up—There’s always another move! Part adventure tale, part leadership guide, the second edition features new case studies of the strategies in action, tools to uncover and resolve conflicts, and expanded resources. An updated epilogue compares the leadership styles of the famous polar explorers Shackleton, Amundsen, and Scott. Today’s leaders have much to learn from this gripping account of survival against all odds. Leading at The Edge will help them bring order to chaos—and achieve success in the face of adversity. Our Leadership at The Edge keynote recounts the dramatic saga of Shackleton’s Antarctic Expedition with vivid photographs and videos, and illustrates the strategies for success. Learn more about this keynote. In our continuing effort to research and understand what it takes to lead at The Edge, Dennis Perkins spent three weeks in Antarctica retracing Shackleton’s Expedition. Browse photos and video footage of his trip.